HP Stream 8 with extreme USB Connectivity. Good showcase, bad solution. I’ve tested this before but it needs to be done again. 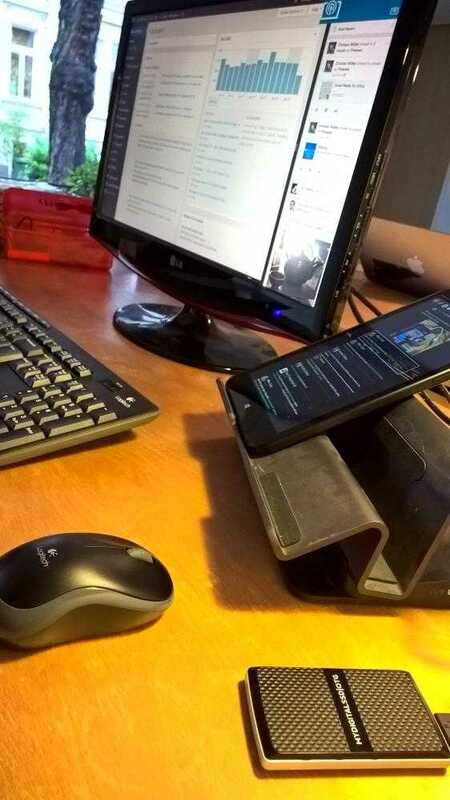 A sub-$200 8-inch Windows 8 tablet with external Full-HD screen, Gigabit Ethernet, a 256GB SSD, external sound module and USB keyboard and mouse all driven over one UBS 2.0 link. I’m using the HP Stream 8 here. Here’s the display set-up I’m working with now. IE11 (Modern) on the left with Bing News on the right on the main screen. On the tablet screen I have Tweetium running.